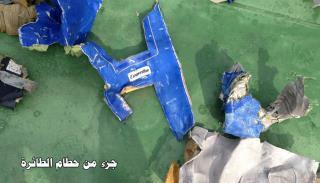 (Newser) – Smoke was detected in multiple places on EgyptAir Flight 804 moments before it plummeted into the Mediterranean, but the cause of the crash that killed all 66 on board remains unclear, the French air accident investigation agency says. Agency spokesman Sebastien Barthe tells the AP that the plane's automatic detection system sent messages indicating smoke a few minutes before the plane disappeared from radar while flying over the eastern Mediterranean early on Thursday morning. The messages, he says, "generally mean the start of a fire," but he adds: "We are drawing no conclusions from this. Everything else is pure conjecture." I saw an accident investigator who pointed out that a catastrophic decompression can result in vapor that detectors can register as smoke. "generally mean the start of a fire," Whew. Don't try to sneak anything by this guy. Magic TV box person said the Mediterranean is nearly a mile deep. I don't know if they'll be able to bring up enough wreckage to ascertain exactly what happened. An explosion doesn't always mean sabotage.